Atlas Bronze -- Your speedy source of metal products! 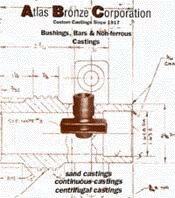 The Atlas Bronze Corporation specializes in supplying bushings, bearings, bars, blocks and other non-ferrous parts. Atlas Bronze Corp offers a complete line of continuous, sand and centrifugally cast products in many bronze and brass alloys, even yellow brass. Atlas Bronze has trained engineers that are available for customer consultation in the event of problems specific to castings. We supply all non-ferrous alloys, aluminum, copper, lead and zinc-based. In addition to supplying and stocking numerous types of "standard" pieces, we are capable of supplying special runs. We supply general machine parts, such as gear blanks, pullies, valve bodies and brackets. The castings supplied by Atlas Bronze can be supplied, machined and ready for installation - i.e., plain bushings, flanged, split and half-bearings, all manufactured to engineering specifications. We also can do grooving and graphiting on any size bearing. Complete machining facilities are available to service your needs. Atlas Bronze is capable of supplying castings that weigh up to 10,000 lbs. in brass and bronze alloys and up to 300 lbs. in aluminum alloys. 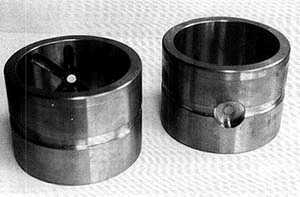 Bearings can be continuously cast to a 16" maximum diameter, sand cast to 40" (maximum diameter) and centrifugally cast up to 76" (maximum diameter). 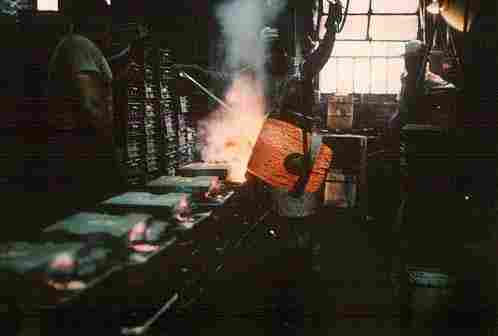 In order to produce the best possible casting for the job, a legible drawing or sketch of the piece should be made available to the foundry from which we will make a pattern. Patterns can be supplied to produce one piece only, or for long production runs. Casting to shape can yield significant savings, in material costs as well as reduce machining time, even with the added cost of the pattern considered. 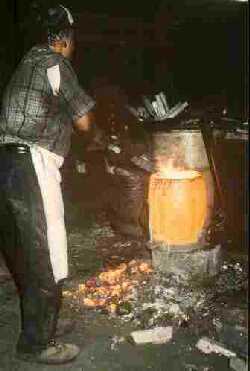 The finish required for a casting to machine smooth is usually an eighth of an inch or less. Draft requirements should also be kept in mind. For continuous and centrifugal castings it's not necessary to buy a pattern. Fully computerized job pricing allows a quick answer to all pricing questions, quotations generally only take a few minutes to complete. The foundry maintains an extensive cross reference library of alloy specification, from government specifications to obsolete manufacturer's trade names. Certification of ingots, chemical analysis and physical test reports can be furnished upon request. 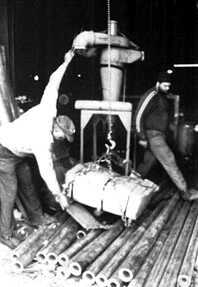 Atlas Bronze Corporation has been in business for over 90 years and that's a lot of experience in the bronze casting industry. Custom crafting and "non-standard" order parts and materials are our specialty. We pay particular attention to quality and to getting the job done on time. Fax, e-mail or call us with your requirements for a speedy computer generated estimate.